I just realized that almost my entire PlayStation Portable library is retro game remakes and collections. Other than the two imports shown in the photo (Patlabor MiniPato and Echochrome) and every Metal Gear game released on the console (not pictured here because I actually have a shelf dedicated entirely to my Metal Gear games), the rest of these are all remakes, updates, and/or compilations of old games. Ridge Racer maybe doesn’t count, because it’s not really a remake, but I also probably wouldn’t have bought it if it was some other racing title. Notable is the fact that the PSP hosted the first official US releases of Dracula X, Gradius II, and Gradius Gaiden, on their respective PSP collections. So there’s that. 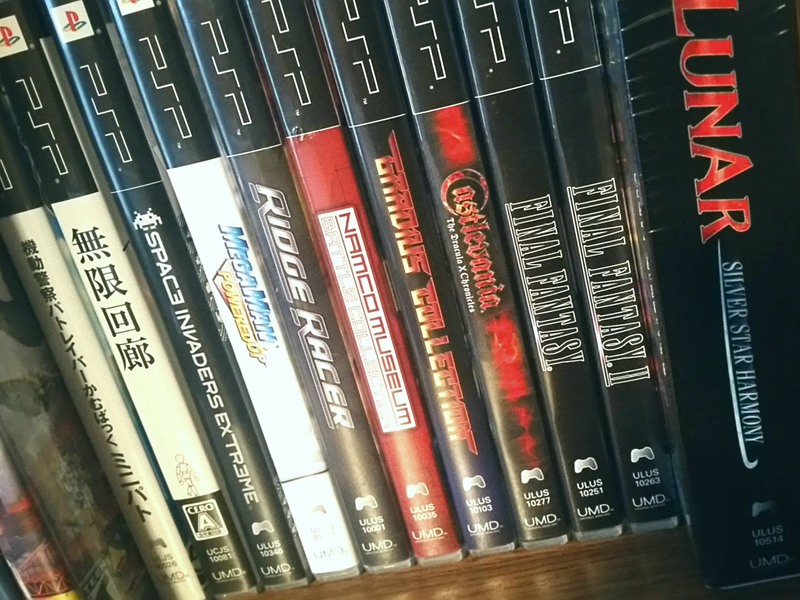 I used to have more original PSP titles, but sold them off as part of my efforts to downsize my collection, which is another topic I’ll write about sometime soon. I find it interesting, then, that the games I chose to keep are mostly the tried-and-true favorite classics.